The Guardian AngelTM Law Enforcement model was created with only one goal in mind - to make it home safe. As a police officer, you are expected to react to a variety of situations. Having the right tools that help you do your job more effectively and safely are vital. 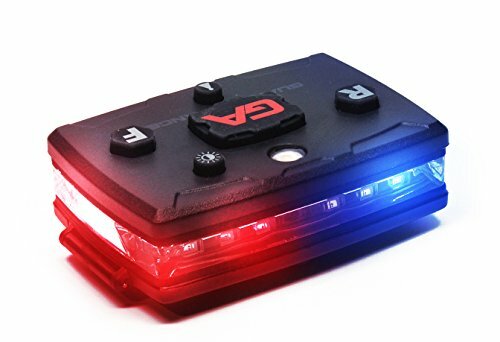 The Guardian AngelTM light allows you to keep your hands free, while providing the visibility that you need, and that civilians need to see you. Whether you are working traffic detail, doing a routine traffic stop, or walking the beat, the Guardian AngelTM is here to offer you the extra protection that visibility can provide in all situations. •Included Neodymium Rare Earth Magnet increases the versatility and mounting options of the Guardian AngelTM. MAKE IT HOME SAFE - The Guardian AngelTM LE was designed by Police Officers, for Police Officers. Make yourself visible and identify yourself in all situations. Red/Blue and Blue/Blue LEDs match the colors of your department. BE VISIBLE AT ALL TIMES - With a total of 24 high output LED's rated up to 450 lumens, the Guardian AngelTM offers up to 2 miles of visibility. Routine traffic stops, Road detail, and Foot Pursuits are much safer with a Guardian AngelTM on your shoulder. 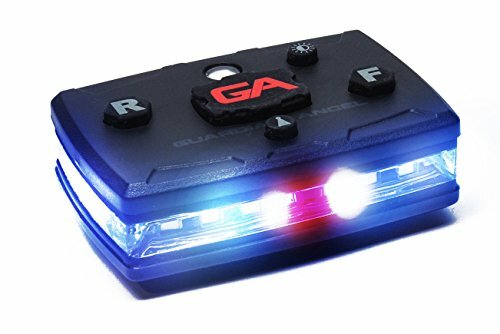 INDEPENDENT OPERATION - The Guardian AngelTM has front and rear facing LED's that can be operated independently. Activate your rear lights for a routine traffic stop, or your front working lights to see in the dark. Simple one button activation makes the Guardian Angel quick and easy to use. An Emergency light can be activated with one button to activate front, rear, as well as upward lights to identify yourself in any situation, allowing backup to find you faster. DURABLE CONSTRUCTION - Weighing only 6 ounces, the Guardian AngelTM is lightweight, but built to last. The water resistant polycarbonate and ABS construction will keep the Guardian Angel active your entire shift, and stand up to daily abuse. The 2000mAh lithium polymer rechargeable battery is fully sealed, and provides up to 93 hours of continuous use in all weather conditions. With a less than 8 hour charge time, the Guardian AngelTM can be quickly charged on shift if necessary. UNIVERSAL MOUNTING - The Guardian AngelTM comes standard with a neodymian rare earth magnet mount. You can attach this mount underneath your clothing, or purchase the many available mounts for your shirt epaulet, bike mount, or windshield mount. The included magnet also works to attach to the hood of your vehicle for certain situations.